NOTE: Some time ago, I wrote about Net Pool Pricing (NPP). Given some recent inquiries I’ve received following my generally unsuccessful attempts to take advantage of NPP in the inaugural “Score with Simon” pool, I thought now might be a good time to revisit the subject. With new bets littering the horse wagering landscape like bruised egos at a sports fantasy camp, perhaps the greatest boon to pari-mutuel bettors — Net Pool Pricing (NPP) — was greeted with little fanfare when it was first introduced to an American audience as a result of the 1996 Breeders’ Cup, which was held at Woodbine race course. Arguably the biggest Canadian import since John Candy, NPP allows for different breakage, takeout and currency exchange rates to exist harmoniously within the same pool — something that has become increasingly more important as simulcast betting continues to expand globally. Yet, Net Pool Pricing didn’t become the norm at most U.S. tracks until just a few years ago. “I believe the first track to use Net Pool Pricing in the U.S. was Arlington Park — and they started in 2004,” noted Liz Bracken, vice president and director of simulcast sales and content acquisition for the New York Racing Association (NYRA). “Net Pool Pricing was instituted at all NYRA tracks approximately October 19, 2005. “I remember it was about a week before the Breeders' Cup that we held at Belmont that year,” Bracken added. While NPP has had little effect on win bettors, those seeking value in the place and show pools have surely noticed a positive change, especially in races featuring a heavy favorite. Because the amount returned to winning ticket holders is divided after the takeout and currency adjustments have already been accounted for, the days of severely discounted place and show payoffs on every horse whenever a chalky choice hits the board have become a thing of the past. Win odds: ($406,172-$32,786)/$32,786= 11.35 (adjusted for nickel breakage). Show odds: ($198,129-$11,522-$178,658-$12,245)/3/$11,522= 0.05 (minimum legal odds). Win odds: (($406,172-$27,868)/$27,868+1) x (1-0.15)-1= 11.35 (adjusted for nickel breakage). Place odds: (($109,026-$11,371-$42,714)/2/$11,371+1) x (1-0.15)-1= 1.90. Show odds: (($198,129-$9,793-$151,859-$10,408)/3/$9,793+1) x (1-0.15)-1= 0.60. Place odds: (($109,026-$11,371-$42,714)/2/$42,714+1) x (1-0.15)-1= 0.35. Show odds: (($198,129-$9,793-$151,859-$10,408)/3/$151,859+1) x (1-0.15)-1= 0.05. Show odds: (($198,129-$9,793-$151,859-$10,408)/3/$10,408+1) x (1-0.15)-1= 0.55. Notice that, under the NPP model, only the place and show odds on Indyanne are lower than those computed before, while the corresponding odds on Porte Bonheur and Informed Decision are considerably higher. This is particularly significant to show bettors, as it allows value-oriented players to find viable alternatives to a heavy favorite without needing them to win. 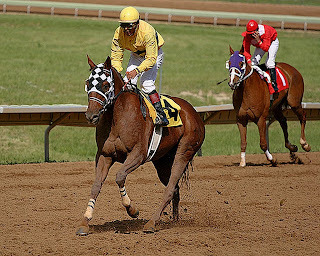 Such was the case in the 2008 Preakness Stakes when Big Brown paid $2.40 straight, while the show returns on Macho Again and Icabad Crane checked in at $10.40 and $5.60 respectively. Show odds: (($198,129-$9,793-$10,408-$7,064)/3/$9,793+1) x (1-0.15)-1= 4.75. Show odds: (($198,129-$9,793-$10,408-$7,064)/3/$10,408+1) x (1-0.15)-1= 4.50. Show odds: (($198,129-$9,793-$10,408-$7,064)/3/$7,064+1) x (1-0.15)-1= 6.70. In this scenario, Pete Bonheur returns $11.50 to show and Informed Decision, $11.00. Given that most negative pools — those requiring the track to kick in money in order to compensate winning bettors — are generated in short fields, these types of generous payoffs add a whole new twist to value wagering, as they provide horseplayers with a relatively high-percentage method of beating the races. Under NPP, simply by limiting one’s wagering to the best one or two non-favored entrants in races featuring a negative place or show pool, sharp handicappers can realistically expect to break even or show a slight loss while holding out for the occasional windfall that puts them solidly in the black.